Regardless of whether a company just needs to have a single consignment transported from A to B, or wants to outsource the daily handling of goods and freight, Thurah Transport can perform the task. “All the way back in 1881, Thurah began driving for what, at that time, was called Kjøbenhavns Telefon Aktie Selskab (KTAS) on Nørregade in Copenhagen. I believe we were Thurah’s sole customer at that time. 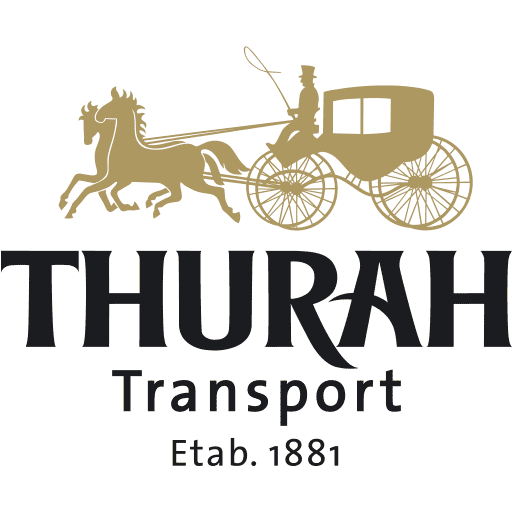 And all the way up to the end of the 1980s, KTAS/TDC had a significant cooperation with Thurah on haulage and transport. Logistics is a key word everywhere in the corporate world. In the construction industry, tradesmen must have easy and simple access to the materials they need – regardless of whether it is in a basement, a back yard, on the roof of a high-rise building or on the sixth floor. Thurah Transport performs the task. Our modern crane lorries arrive with the materials and lift them to where they are needed. We also do this in many industries. We handle the transport of machines, cable drums, logs and steel constructions too. We have the necessary equipment and special tools. Not only does Thurah Transport perform transport tasks for customers who need the use of cranes and delivery vehicles. We also transport gravel, soil and building materials. The solutions we offer have been considerably strengthened after HBJ Transport became a part of the Thurah family. We receive, register, store and dispatch freight and goods for our customers on a daily basis. This is everything from smaller pick articles, parcels to the onward transport of cumbersome freight with crane, such as building materials, windows, glass, trusses, steel constructions and similar to construction sites where they are hoisted and fitted. The options are many for a storage hotel and storage. We listen to the customer’s needs and then customise the optimal solution. In principle, everything is possible. Just call us.